6 Bedroom Detached House For Sale in High Wycombe for Guide Price £1,795,000. 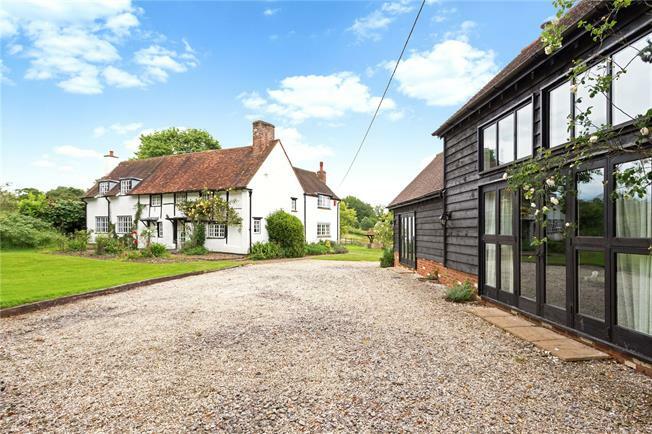 EQUESTRIAN - A well-appointed Grade II listed, 16th century six bedroom detached cottage set in grounds and paddocks of just under 3.4 acres with a detached converted barn, stabling, orchard and paddock land. Crown Cottage dates back to circa 1500 and has been held in the same family for nearly 50 years. The property has undergone extensions and refurbishments over the years to now provide 3,055 sq. ft. of modern accommodation. In 2009 the current owners converted a detached barn to create a superb annexe space with a wealth of character including vaulted ceilings, exposed beams and a brick fireplace with an open fire and accommodation including an open plan sitting room and kitchen, En Suite bedroom, utility and cloakroom. Situated within the village of Ibstone with views over fields and woodland, the house is only 2.5 miles to junction 5 of the M40. High Wycombe provides fast (25mins) rail links to London Marylebone making this an ideal rural retreat. The local village infant school is within level walking distance, there is an outstanding primary school in Stokenchurch and senior schools are in High Wycombe or Marlow, including renowned Grammar schools. Located in an Area of Outstanding Natural Beauty in the Chiltern Hills. Crown Cottage sits within gardens and grounds of just under 3.4 acres including mature lawned gardens, two paddocks with post and rail fencing, orchard with fruit trees and vegetable garden. Outbuildings include stabling for three horses and tack room, detached poultry shed/storage barn and triple open carport. The gardens around the house are mainly laid to lawn with a variety of paved seating areas, flower and shrub borders, block paved pathways and a variety of mature trees. To the rear of the property is a pathway leading up to a lawned garden which has a feature pond and mature trees with a treehouse with power and light. There is also a paved seating area with views of the paddocks. The front door opens into the reception hall which has exposed beams and provides further access to the sitting room, dining room and inner lobby. The dual aspect sitting room overlook the gardens and has an inglenook fireplace with a tiled hearth, exposed beams and in the corner is a staircase, concealed behind a door, leading to the first floor, a further door leads into the study and another into the kitchen/breakfast room. The dining room also looks out over the gardens and has an open fire with a wooden surround, and a walk-in shelved cupboard. The dual aspect family room has glazed french doors leading to the garden, an open fire set within a fireplace, with a door leading through to the kitchen/breakfast room and an archway to a second staircase up to the landing. The kitchen/breakfast room is fitted with a range of cream coloured shaker style units with granite work surfaces and a central island. Integrated appliances include a Neff double oven, Neff four ring ceramic hob with extractor hood above, and a dishwasher. There is space for a fridge and freezer, and for a washing machine and tumble dryer. To the side is a breakfast area with space for table and chairs. A door leads to a rear hall/utility area which houses the boiler and has a stable door to the garden. A door from the kitchen area leads to the inner lobby which has a walk-in shelved pantry, and a cloakroom. The staircase from the family room leads up to the landing which provides access to all six bedrooms, two bathrooms and the other staircase from the sitting room. Two Velux windows provide natural light to the landing space. The main bedroom is dual aspect and has views over the gardens and countryside beyond. There is a comprehensive range of built-in wardrobes with hanging space and built-in drawers next to the bed. All the bedrooms have views over the gardens or further open countryside. There are built in wardrobes in bedrooms two and six. Bedrooms three and five have an interconnecting door with bedroom three having a feature fireplace, exposed beams and a built-in wardrobe. There are two bathrooms, one fitted with a suite including a freestanding roll top bath, walk-in double shower, twin wash basins and a WC. The second bathroom has a four piece suite including a corner bath, shower cubicle, wash basin in a vanity unit with a storage below and WC.